Bradford's involvement in physical therapy and rehabilitation as well as the world of sports medicine dates back to some of our first systems. Since the early 1980s, Bradford's spas and therapy systems have been used by healthcare professionals across the miles. The same care, dedication, and quality of production is used in all Bradford products. This single-minded focus of customer satisfaction is what makes so many of Bradford's customers repeat customers. At Bradford we design and fabricate all systems in-house. 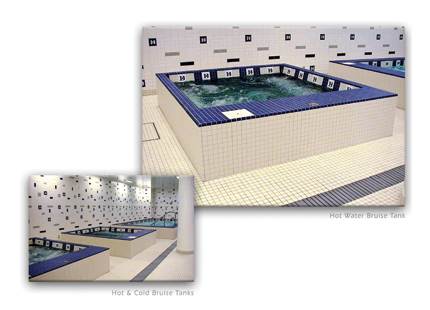 By using only Type 316L Stainless Steel and commercial grade slip-resistant mosaic tile, we give our customers the finest therapy vessels built. Bradford's HydroTherapy vessels are suited for in-grade or above-grade installations (the same as all of our spas and SwimSpas®) or even fully portable. 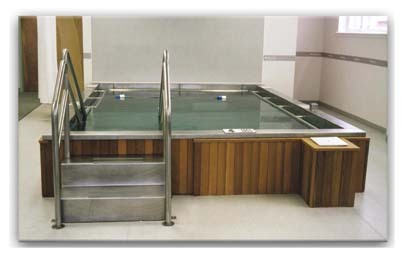 Bradford HydroTherapy units are available in almost any configuration of depths as well as with or without observation windows and come with in-built water treatment and sanitation. 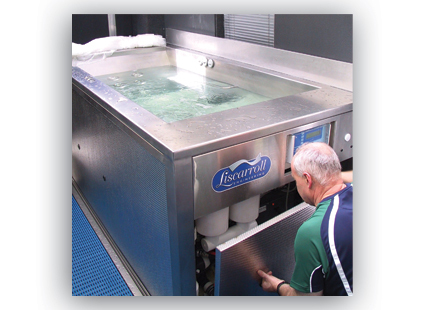 Bradford's contributions to the rehabilitation and healthcare communities include: hot and cold water bruise tanks, soaking tubs therapy jet fitted tubs and therapy vessels with variable flow current for resistance training. Bradford's primary concern and goal in the healthcare field is in making sure that the healthcare professionals have the right tools to do their job. There is no need greater than helping you provide someone with a better quality of life.